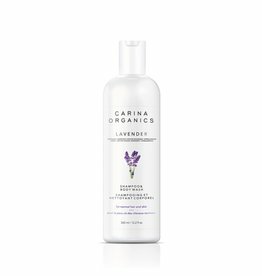 Description: A daily light conditioner formulated with certified organic plant, vegetable, flower and tree extracts and scented with organic extracts from the lavender flower. Helps to restore luster, softness, flexibility, and shine. Detangles instantly. Ingredients: Filtered Aqua, *Cocos nucifera (coconut) oil, Pinus banksiana (pine) extract, *Matricaria chamomilla (chamomile) flower extract, *Urtica dioca (nettle) leaf extract, *Taraxacum officinale (dandelion) leaf extract, *Trifolium pratense (clover) flower extract, *acetic acid (apple cider vinegar), *Olea europaea (olive) fruit oil, *Cucurbita pepo (pumpkin) seed oil, Lavendula officinalis (lavender) oil. Wash away buildup, and treat your hair to a double dose of organic oils infused with lemongrass. Clarifying conditioner that washes away buildup while also promoting soft, hydrated and healthy looking hair.